Note: This story has been updated to reflect the shrinking availability of eclipse glasses. Look, just because the total solar eclipse is a once-in-a-lifetime celestial event doesn't mean you should destroy your once-in-a-lifetime set of eyes watching it. Everyone hoping to witness the full splendor of the shining solar corona needs to wear special protective glasses, but if you've waited a bit too long to get your hands on a pair, you'll probably find most places sold out by now. Don't freak out. Here are your options before August 21 and why you need the protection if you plan on enjoying the eclipse. According to NASA, the experts on once-in-a-lifetime celestial event stuff, the biggest danger to your eyes is the partial solar eclipse that will be visible to most people who can’t make it to the 70-mile-wide “path of totality,” spanning Oregon to South Carolina. Because the sun won’t be fully obscured by the moon, it’ll be particularly dangerous to look at the sun with the naked eye. It can definitely blind you, full stop. The same is true even if you’re lucky enough to witness the stunning darkness of the eclipse from a coveted spot on its path. This kind of damage will not heal, can’t be fixed, and doesn’t hit any pain receptors while it’s happening. Your vision will be destroyed without you even feeling it. Everyday sunglasses will not protect you. No matter how dark they are, they let literally thousands of times too much light into your retinas. In fact, the safety standard the special shades need to meet is one that blocks out 99.99% of all light filtering into. That bar may be high, but it’s necessary. The bad news is that, at this point, according to the American Astronomical Society, which heroically set up a comprehensive rundown of where to find them before they sold out, most of the ISO-compliant (more on that in a sec) eclipse glasses you could purchase online are gone. The AAS explained the situation in a note on its website: "It is now too late to buy solar viewers in time for August 21st. Virtually all vendors are sold out, whether or not they’re listed as such below. See our pinhole projection page for other ways to enjoy the partial phases of the eclipse." There might be some hope to be found in brick-and-mortar stores, but you'll have to call ahead to specific locations to verify availability. According to the AAS, it's safest to buy glasses that comply to ISO standards in a physical store. The society has listed the following retail chains as reputable, reliable brick-and-mortar retailers. There are a few different options for this still available. For starters, NASA will be giving out 1.5 million glasses at events and locations around the country. Use this guide to figure out the one closest to you. 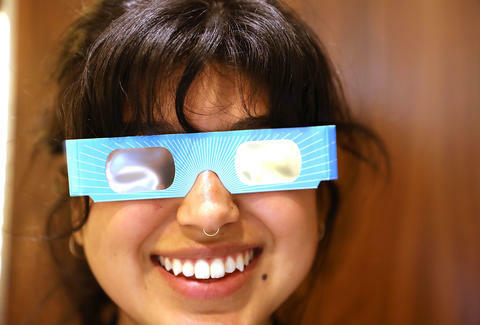 There are also 6,900 libraries across the United States handing out solar eclipse glasses for events on Monday, thanks to help from NASA, Google, and the Gordon and Betty Moore Foundation. You'll want to use this map to learn where you can find them and when the events are scheduled. It's important to make sure, no matter where you get your glasses from, that they are ISO-compliant. That refers to a very specific international safety standard, ISO 12312-2, which refers to filters used for direct viewing of the sun. There is a long answer to the question of what that means, helpfully also provided by the AAS, but the short answer is simple: look out for counterfeit glasses that shameless profiteers have used to flood the solar eclipse viewing market. Moreover, it's easy enough for these shameless vendors to grab the ISO logo from the internet and stick it on their labels. The best possible recourse anyone can fall back on is abiding by AAS's list of reputable vendors when making your purchases. The organization cross-checks their ISO paperwork and has done the due diligence of making sure those vendors' glasses are actually safe. If you come across eclipse glasses that do not explicitly make clear that they meet the ISO 12312-2 standard laid out in 2015, do not use them to look at the sun during the eclipse. Remember: you will not feel your vision rapidly burn away. There's a very good possibility you won't be able to track a pair of these down in time for Monday's eclipse, but have no fear, there are very simple hacks to avail yourself of. The best one involves making your own pinhole projector: an idiotically simple process that involves a cereal box, paper, aluminum foil, and about five minutes of your time. Here's how to pull it off. Additionally, there's an even easier remix of that hack preferred by Neil deGrasse Tyson which involves literally just holding up a spaghetti colander. If you want to get a little bit fancier, the AAS has tutorials on how to build a optical projector, which involves mirrors and a little more effort, but will give you clearer, sharper images. Whatever your method, make sure you don't look at the sun on Monday afternoon without proper protection. It's once-in-a-lifetime. Don't miss it. Don't go blind watching it, either.